Microsoft’s announcement, on Monday, that it would purchase LinkedIn—its biggest acquisition ever, at more than twenty-six billion dollars—brought to mind an earlier takeover attempt, almost a decade ago. Back in the mid-aughts, Microsoft’s C.E.O. at the time, Steve Ballmer, flew to Palo Alto to try to convince Mark Zuckerberg, the young C.E.O. of Facebook, to let Microsoft buy his company. During Facebook’s first couple of years, bigger companies had dismissed it, and social networking in general, as a fad for college kids; Zuckerberg had even admitted that he didn’t care how Facebook would eventually make money. But Ballmer, who wanted to catch up to Google in the online-advertising business, was beginning to see Facebook’s power. People were signing up for accounts in extraordinary numbers. If Microsoft could acquire Facebook, it would gain a user base that could eventually rival Google’s—just what advertisers wanted. It might seem surprising, in that context, that Nadella has now staked his career on acquiring a different social-networking company. But with this purchase Nadella’s motivation is different from Ballmer’s. Back when Ballmer was courting Zuckerberg, online advertising was seen as one of the most promising ways to make money on the Internet, But to attract significant advertising revenue, you must have access to millions, even billions, of users. Facebook and Google have been so successful at consolidating ads on their services that their competitors, including Microsoft, have concluded that they don’t stand much of a chance at building big advertising businesses of their own. On the whole, Microsoft is doing well—its stock price has risen more than thirty per cent since Nadella’s appointment as C.E.O.—but the coming years could be challenging. In April, the company’s growth results for its cloud business disappointed investors and raised worries about how well it is adapting to the subscription-based model and competing with scrappier rivals. 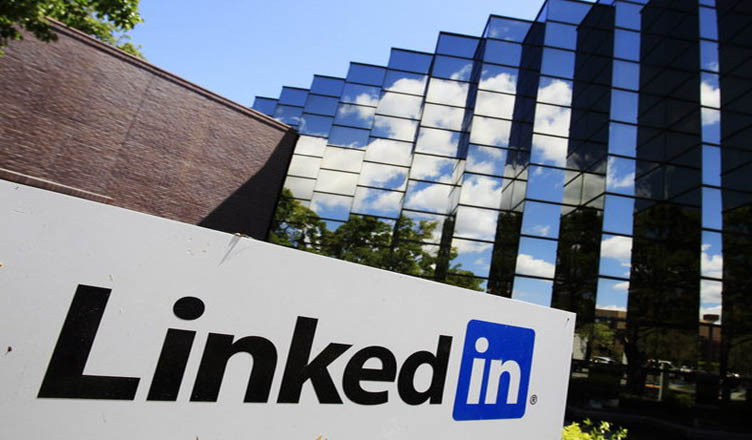 LinkedIn, for its part, has been struggling; in February, its stock dropped more than forty per cent in a single day, after it announced a forecast that fell far short of what analysts had expected. The company’s C.E.O., Jeff Weiner, has blamed its recent troubles largely on a broader economic slowdown; LinkedIn’s business model relies on charging employers and employees for premium services, like sending messages to strangers, and when the economy isn’t thriving headhunters and workers tend not to be as willing to pay for connections. As Nicholas Lemann wrote in a Profile, last year, of the LinkedIn founder Reid Hoffman, “Silicon Valley is obsessed with ‘scale,’ and LinkedIn is, as yet, insufficiently enormous.” On Monday, Weiner acknowledged as much. “Imagine a world where we’re no longer looking up at Tech Titans such as Apple, Google, Microsoft, Amazon, and Facebook, and wondering what it would be like to operate at their extraordinary scale—because we’re one of them,” he wrote. At the time, Ballmer said something very similar to what Nadella is saying now: “Yammer adds a best-in-class enterprise social networking service to Microsoft’s growing portfolio of complementary cloud services.” But Microsoft was slow to integrate Yammer into its existing products, and nowadays Yammer, which was once a much-talked-about startup, doesn’t often get mentioned in Silicon Valley. the first comment was addressed to Nadella: “You’ve had a tougher track record” with big acquisitions, the questioner noted. “Why is this deal different?” Nadella gave a reasonable answer that mentioned the size of both companies’ potential markets, the similarities of their missions, and a plan to allow LinkedIn to operate independently, with Weiner reporting to Nadella. But, as always, Microsoft’s success with this strategic move will ultimately have less to do with its theoretical underpinnings than with its execution. Next Next post: Enterprise Mobility – Now and Ever!